After the competitor has shot his two single targets from stations 1, 2, 6 and 7, he remains on the pad and shoots a "double", ie two targets are released simultaneously, one from each house, one shot is fired at each target. 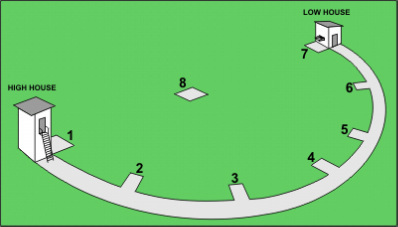 If at any time during a round a competitor misses a target he then reloads one cartridge and repeats the first target that he has missed; however, if he gets to station 8 and has broken all of the 24 previous targets, he then repeats his last target to complete the 25 target round. The above comments also apply to this discipline. The gun must be in the classic ISSF down position when the target is called and there can be up to a three second delay before the target is released. A 24 gram loads must be used for all ISSF shooting. This is shot with a simultaneous pair thrown from each station except No. 8.